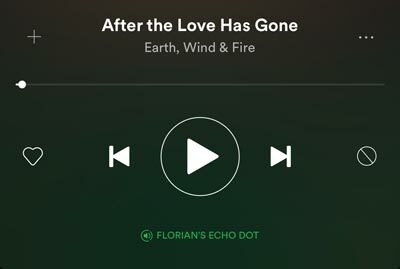 Amazon Echo and Spotify work together really well. In this article, I will tell about the many different possibilities you have, for instance: How to control Spotify with Alexa with voice commands, how to use an Echo Device with Spotify Connect or even hot to setup a cheap multiroom solution for playing synchronised music in different rooms. If you haven’t done: Set up your Alexa device using the Amazon Alexa App. Go to Settings in the Alexa App, then Music & Media and link your Spotify account. A lot of Amazon Devices are supported: Amazon Echo, Amazon Echo Show, Amazon Echo Dot, Amazon Echo Spot, Amazon Tap and Sonos One. 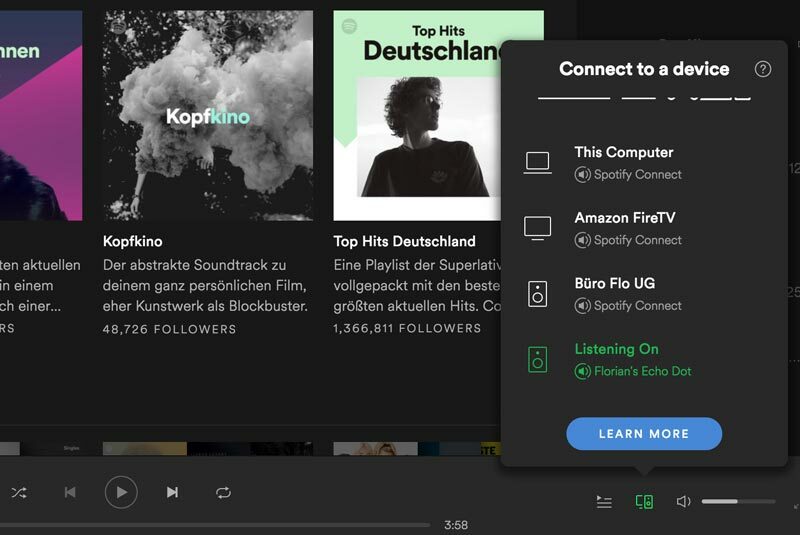 The concept of Spotify Connect is simple and really easy to understand: Just play your music on the Spotify App (for instance iOS App or Desktop Mac App). Then, you can choose the Alexa Device as output channel and your Spotify App behaves like a remote control (means: you hear the music not on your iPhone or Mac, but through the speakers of your Alexa Device). Buy an Amazon Echo Dot. Connect some ordinary speakers you already have at home with a 3.5 mm audio cable. Et voilà: That’s a really cheap Spotify wireless streaming solution you can control with your smartphone. And if you are concerned about privacy: Even if you don’t want to use the voice commands and the microphone (because of privacy reason), you can disable this functionality permanently (press the mute button at the top, the echo dot glows red and doesn’t listen any more). Here are some of the supported voices commands. Of course, you have to start with Alexa, …. If you don’t want to say “… from Spotify” every time, you can setup Spotify as default music player. Go to Settings in the Alexa App, then Music & Media. Click Choose default music services and select Spotify. Yes, this is possible! So that’s really a cheap way for playing audio in multiple rooms at the same time. You can bundle several Echo Devices in order to play synchronised audio in different rooms. Great guide. However I was looking for a similar thing, namely how to use my alexa echo dot to control my Blue Sound Pulse using Spotify connect. As it stands now, if I ask alexa to play a song it does so on the echo and not on my speaker. I could of course connect the speaker via Bluethooth but this is not what I want.